A photographic postcard featuring The Senator, the giant bald cypress tree that was once the oldest and largest cypress tree in the country. At the time that the photograph was taken, The Senator was 3,500 yers old, 126 feet and 3 inches tall, and 47 feet in circumference. As early as the late 1800s, this centuries-old tree was considered a tourist attraction, but it wasn't until 1927 that a park was established around the tree. Senator Moses O. Overstreet donated six acres of land, which included the tree, to Seminole County to establish a park with the stipulation that a road would be built to take visitors into the park. The generosity of Sen. Overstreet inspired residents to name the giant cypress tree "The Senator." Located at 761 General Hutchinson Parkway in present-day Longwood, Florida, the new park was named the Seminole Big Tree Park in honor of the main attraction. In 1929, President Calvin Coolidge (1872-1933) dedicated a bronze plaque at the site of the tree. The plaque was stolen in 1945, which would place this photograph sometime between 1940 and 1945. Based on a core sample taken by the American Forestry Association, The Senator was estimated to be 3500 years old in 1946. The Big Tree Park also features another giant cypress estimated to be 2000 years old. In 2005, local elementary students named the tree Lady Liberty. It was considered to be the companion tree to The Senator, as they were only 40 feet apart. The Senator continued to be a tourist attraction and local landmark until January 16, 2012, when it was lost in a fire. 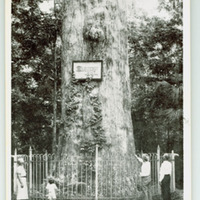 Postcard image of the Big Tree in Sanford. Image depicts the tree with a plaque on the front, surrounded by a fence. Two men, a woman, and a young child can be seen in front of the tree, looking up at it. The caption on the front of the postcard reads, "Big Tree Park. The Oldest and Largest Cypress Tree in U. S. A. 126 ft. 3 in. High. 47 ft. in circumference. 3500 Years Old. Sanford, Seminole County, Florida." Original 14 x 9 centimeter black and white photographic postcard: "Big Tree Park." Special Collections & University Archives, University of Central Florida, Orlando, Florida. Digital reproduction of original 14 x 9 centimeter black and white photographic postcard: "Big Tree Park." Tag number DP0008223, Central Florida Memory. Original 14 x 9 centimeter black and white photographic postcard: "Big Tree Park." Longwood Collection, Seminole County Collection, RICHES of Central Florida. Copyright to this resource is held by Special Collections & University Archives and is provided here by RICHES of Central Florida for educational purposes only. BIG TREE PARK. THE OLDEST AND LARGEST CYPRESS TREE IN U.S.A. 126 FT. 3 IN. HIGH. 47 FT. IN CIRCUMFERENCE. 3500 YEARS OLD. SANFORD, SEMINOLE COUNTY, FLORIDA. 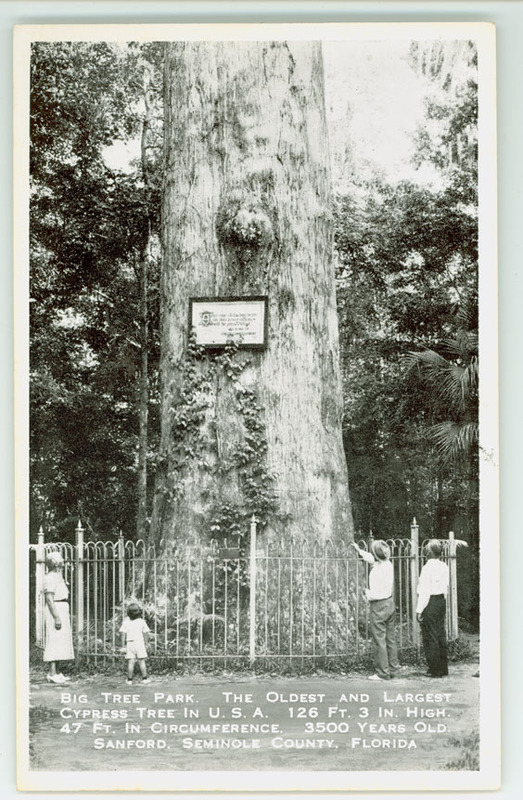 “Big Tree Park, the Oldest and Largest Cypress Tree in U.S.A. Postcard.” RICHES of Central Florida accessed April 26, 2019, https://richesmi.cah.ucf.edu/omeka/items/show/5057.